Why pledge Mu Beta Psi? There are a million reasons to rush and to pledge, you just have to find yours! Do you have to be in a music ensemble? Yes. As of right now, eligibility is open to those in any Musical Ensemble at Rutgers University. This includes any Rutgers choirs, bands, ensembles, etc. What are the requirements to pledge Mu Beta Psi? First year students are not allowed to pledge their first semester (normally fall semester). How do I begin Pledging? In order to pledge, you must attend at least one rush event, however attending more than one is strongly recommended. Following this, you must attend formal rush with a letter of intent explaining why you want to pledge Mu Beta Psi. This letter must be signed by two Brothers before the meeting in order for you to be considered. After this is done, the Brothers will then hand out bids to those who qualify, and if you receive one there will be directions on how to being the process, and pledging will commence. Rush is a week of social events during the beginning of each semester that is used to welcome anyone in the musical community who might be interested in getting to know the Brothers better. There is absolutely no pressure to pledge during the rush events – they are meant to be FUN, and inform you of who Mu Beta Psi is and what we stand for. The formal rush event is when you let the Brotherhood know you are interested in pledging. Pledging is basically a semester of getting to know the Fraternity and its Brothers while they get to know you. The Pledging season usually lasts eight weeks. During this time, Pledges are expected to attend a weekly Pledge meeting on Sunday, and then during the week meet with Active, Inactive, and Alumni Brothers, as well as study Fraternity materials. This is led by the Membership Coordinator and his/her committee, who carefully guides the Pledges through the semester. The more time and effort you put into the pledging process, the more rewards you will reap from it at the end. Outside of the pledging process, the Brothers hold weekly meetings on Sunday afternoons/evenings, where the length of time will vary depending on what needs to be discussed. There are also other various fundraisers, music events, and service events thrown into the mix where the time also varies. 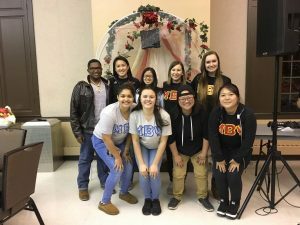 The Brotherhood also has ongoing activities and events planned for themselves and other musical organizations on and off campus, which Brothers elect to attend and help with. How much does Mu Beta Psi cost? National dues are $40 per semester, and by paying dues you are termed an active Brother from October 15, year 1- October 14, year 2 (unless you pledge in the spring and you only pay for that semester). There are also chapter dues which can range anywhere from $40-$60 each semester. This money goes towards anything we do as a local chapter such as picnics, formals, and other fun activities strictly for the Brotherhood as well as events for the musical community. Do you have a house? The Brothers do not own a house. 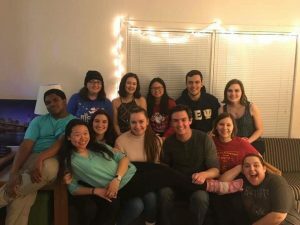 There is a strict zoning area for all Fraternity and Sorority houses at Rutgers University and at the time there are no available lots, and there are other Fraternities and Sororities on the waiting list. Because the Brothers do not own a house, this is one of the reasons our fees to be a Brother are less than other National Fraternities and Sororities you may have looked at. What is Mu Beta Psi’s Hazing Policy? well as at Rutgers University Office of Fraternity and Sorority Affairs, to prevent any sort of hazing. No is forced to do anything against their own will and it is not tolerated when others do so. To view the Rutgers University OFSA hazing policy, please click here. What is Mu Beta Psi’s Alcohol/Social Policy? You can view the Rutgers Office of Fraternity and Sorority Affairs social policy here. What are Mu Beta Psi’s National Policies? You can view all of Mu Beta Psi’s National Policies here.